Princeton Online websites are built in WordPress, a powerful content management system that’s easy to use and is supported by a vast network of open source experts. 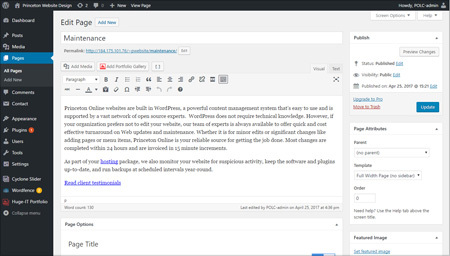 WordPress does not require technical knowledge. However, if your organization prefers not to edit your website, our team of experts is always available to offer quick and cost effective turnaround on Web updates and maintenance. Whether it is for minor edits or significant changes like adding pages or menu items, Princeton Online is your reliable source for getting the job done. Most changes are completed within 24 hours and are invoiced on a monthly basis in 15 minute increments. As part of your hosting package, we also monitor your website for suspicious activity, keep the software and plugins up-to-date, and run backups at scheduled intervals year-round.